A few years ago, I attended my sorority’s 100-year anniversary on the West Virginia University campus. Among the things on display at our sorority house was a former alum’s scrapbook. This book was filled with a ton of super cool memorabilia. But one of the things that totally stood out to me was the dance cards. For each Chi Omega function, the lady kept a card of who she danced with. I did some research on the history of dance cards. 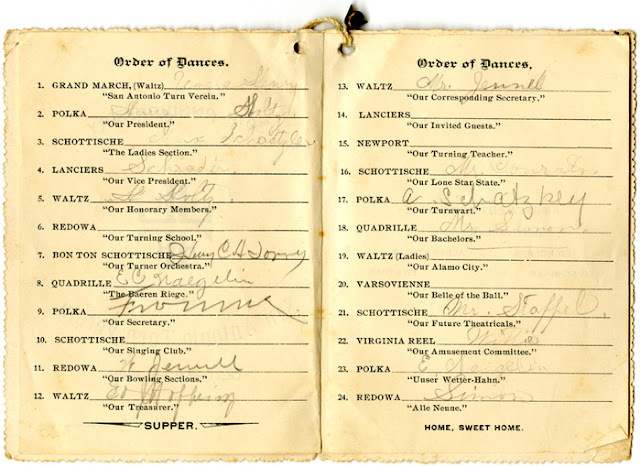 According to Wikipedia, a dance card is typically a booklet with a decorative cover, listing dance titles, composers and the person with whom the women intended to dance. The cover would typically list the name of the event or ball and the booklet would have a decorative cord by which it could be attached to a lady’s wrist. It was common for gents to say to a gal “pencil me into your dance card.” Could this have been one of the original pick up lines?! 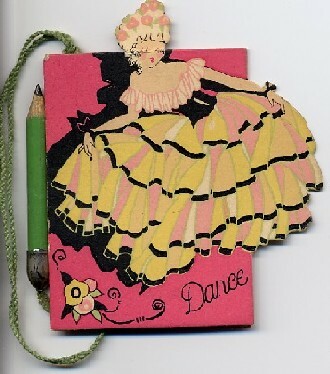 Here are some examples of vintage dance cards. I love the idea of incorporating dance cards into contemporary entertaining. A way to do this is to talking to your deejay before the event and determining the slow songs. Then, create a booklet with the slow songs and space next to song for people to pencil in their dance partner! I found one example of a couple making a dance card for a 2008 wedding that had a 1920’s-inspired theme (source). However, I couldn't upload the pic! Visit the site to see!